This year, Michelle and Liz are joining us, and we are all super excited to kick the whole thing off at QuiltCon (Liz won't be attending but she'll be there in spirit!). 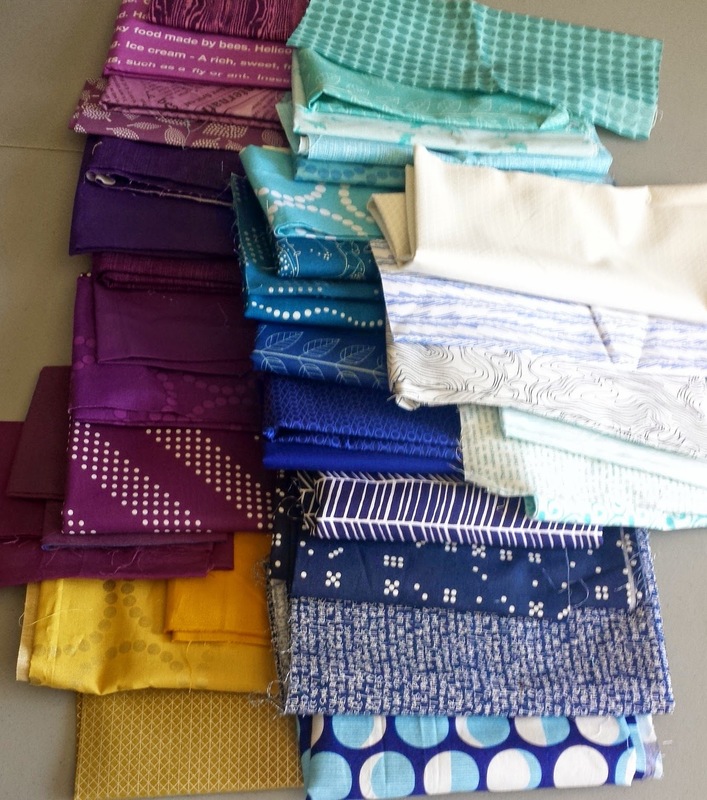 This year, we'll take two months to have each quilt and work on it (which is a lot more manageable than one month). While the starter quilt has a central idea and color scheme, the goal is for the other members to bring their own talents to the table, challenge themselves, and contribute to a quilt that could not be made by just one of us. All the while, we're getting to know each other even more. Each of us sends a quilt starter, or part of the quilt, along with approximately a yard of fabric. My fabric pull was inspired by this mineral palette from Design Seeds. Obviously, purple figured highly into the equation. That little spark of gold is just perfect (I'm thinking the tone on tone Pearl Bracelets and gold Netorious [see above fabric pull] - I haven't found a solid yet that is that shade, but just pops of it will be perfect [that one in the picture is not quite right]). As a neutral, I'd like some pure whites in there, too. Eventually, the "curves" theme popped into my head. 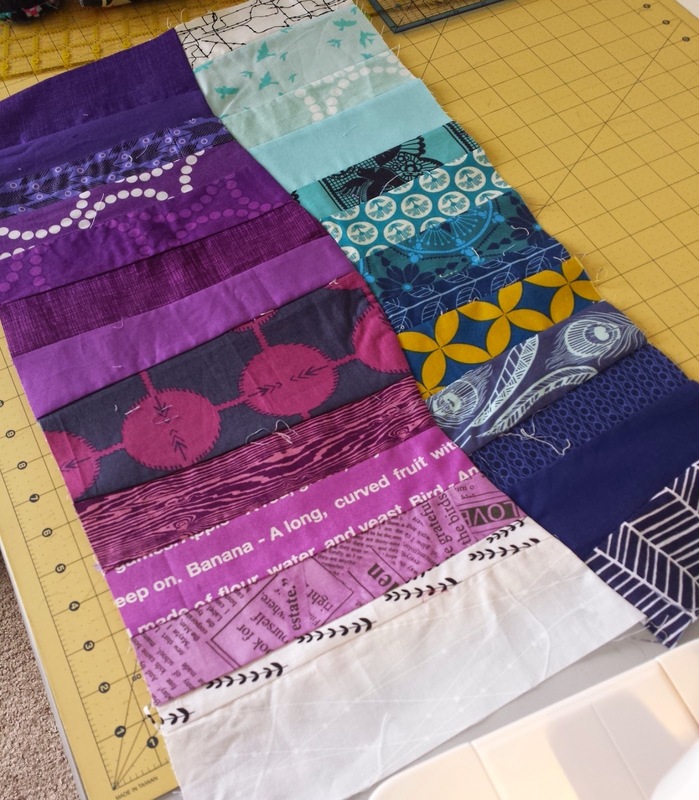 This quilt will be like the kitchen sink of curve quilts. I even made a Pinterest board to organize my thoughts and give my friends some ideas. I started this week with my scraps and made this improvisational curve wave. I will make at least two more additions to my starter before passing it on in Austin (one will probably be a drunken star), and I seriously can't wait to see everyone else's starters! Meanwhile, I need to quilt my first traveling/progressive quilt... *embarrassed. * It WILL happen this year! This was a kitchen sink quilt in jewel tones and I am deeply, madly, irrevocably in love with it. These ladies are so talented. Your design spark and fabric pull are awesome. It will be fun to see your quilts progress this year. Those fabrics are fabulous together. The jewel tones were beautiful, but I really like your palette for this new quilt! I'm so excited to be part of this awesome group of ladies and I already have like 5 ideas for blocks to add to your quilt, and fabric set aside. I have a couple golden yellow solids that might work (Kona Curry, and the AGF yellow I got in my Indelible coordinates pack). Have a Margarita for me at QuiltCon! Love the purple in both the old and new quilts. Hot pink is always great. That sure is a bright and happy quilt. 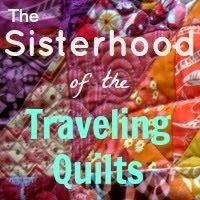 I'm so looking forward to working on your quilt again! I keep shifting mine from last year around and lamenting not getting to work on it. Really, really, really want to finish it this month!